NEW Collaborative brainstorm sessions. With Wridea, your friends can participiate on your ideas by commenting on them. NEW RSS Feeds. Subscribe to your friends' idea or comment RSS feeds and stay tuned! Get your ideas organized. Wridea is easy to use. Letting you create, edit and delete your ideas, pages and categories smoothly and easily. Create ideas. Let your mind focus on new ideas and discover new things. Free your mind by storing all your todo items, ideas, concepts, anything cluttering your mind in wridea. 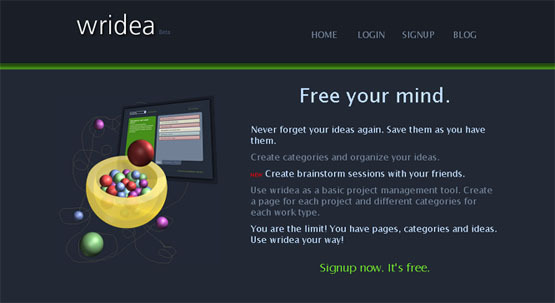 Create categories easily with wridea for categorizing your ideas and thoughts. For example, create a category named "Illustration" and put your new illustration concepts into it. Create pages for collecting each related ideas into single pages, even if they have different categories. For example, you can create a page for one of your projects and add all your ideas, todo items, concepts or anything else related to that project into the newly created page. This is pretty sweet. Here is the link.